Around-the-clock global operations, data growth, and server virtualization all together can complicate protection and recovery strategies. They affect when and how often you can perform backups, increase the time required to back up, and ultimately affect your ability to successfully restore. These challenges can force lower standards for recovery objectives, such as reducing the frequency of backup jobs or protecting fewer applications, both of which can introduce risk. 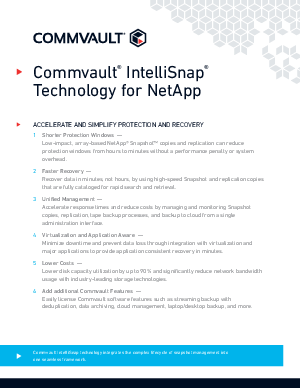 Download this whitepaper to learn more about Commvault's IntelliSnap technology.